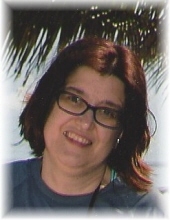 Kathy Ann Lauwers, 49, of Haskins, Ohio passed away Friday April 5, 2019. She was born March 4, 1970 in Findlay, Ohio to Alfons and Geneva (Grismore) Lauwers. She married Janyce Tipton on March 20, 2016 and she survives in Haskins. Kathy worked as a childcare teacher for Owen’s Early Learning Center in Findlay, Ohio for 16 years. She was extremely passionate about teaching and cared dearly for all of the children that crossed her path. She enjoyed reading, shopping, trips to Amish country and attending Toledo Women’s Basketball games. She was an avid Ohio State Football fan. She loved traveling and especially enjoyed taking cruises with Jan. Along with her wife Jan, Kathy is survived by her siblings Walter (Cindy) Lauwers of Mt. Cory, Ohio, Mark (Stephanie) Lauwers of Findlay, Ohio, Ken (Sue) Lauwers of Findlay, Ohio and Deb (John) Morrison of Findlay, Ohio, special daughter Kayla Pratt and several nieces, nephews, great-nieces and great-nephews. She was preceded in death by her parents and brothers Tom Lauwers and Larry Lauwers. Visitation will be held on Wednesday April 10, 2019 from 3:00 to 8:00 p.m. at Dunn Funeral Home, located in the Historical District of Bowling Green at 408 West Wooster St. Her funeral service will be held on Thursday April 11, 2019 at 2:30 p.m. at the funeral home. Pastor Beth Giller will officiate. Memorial contributions may be given in her memory to Animal House Rescue in Wauseon, Ohio. To send flowers or a remembrance gift to the family of Kathy A. Lauwers, please visit our Tribute Store. "Email Address" would like to share the life celebration of Kathy A. Lauwers. Click on the "link" to go to share a favorite memory or leave a condolence message for the family.